We got in early on Monday, checked into our hotel and set out in search of food before starting our first hike. We are big BBQ eaters and typically try to find a new local joint to fuel up on all the protein before we hit the trail. We tried Jessie Rae's BBQ and were unsure of how Western BBQ joints might compare to BBQ in the Southeast. Y'all?! AHHH-mazing! Amazing, amazing, amazing!! We were so impressed! So impressed that I completely forgot to grab a picture, because we devoured it! We got pork, brisket and chicken (plus coleslaw and mac-n-cheese) and licked our fingers clean. There was such an interesting spice throughout the meat and sides and it tied everything together so nicely! From there we rolled down the windows, laced up our hiking boots and headed about 15-20 minutes away to Red Rock Canyon National Conservation Area. Even the drive there was all kinds of gorgeous, but once we pulled into the conservation area the scenes with breathtaking. Red Rock Canyon has a 13 mile drive that you can do, with stops at their many hiking trails ($7 fee per car, $3 per motorcycle/ bike, or free with America the Beautiful pass). We stopped first at the visitors center, where the lady gave us wonderful tips on how to explore the park and which trails would be best for the length of hike/ views we were looking for. 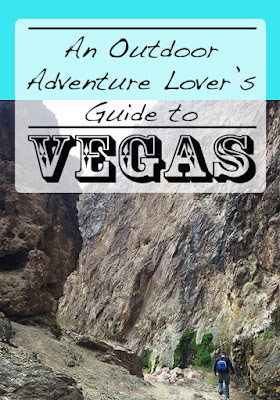 We chose the Calico Tanks Trail, which led you out to stunning, cliff-top views of the Vegas strip down in the valley. It was such a fun hike for these Florida legs!! I was not used to the window factor though at the top of the cliffs, so I crawled along on my hands and knees to make it to this point so Babe could snap a picture (totally worth it). That was the longest hike we did that day and took us about 3 hours, though that included stops to take in all the endless views! That trail's parking lot is towards the beginning of the drive (going from the visitors center), so it left us with even more to see, as we continued on our drive. We stopped at a few other spots to take pictures, one more hiking spot to check out the waterfall near the children's hiking loop (Lost Creek), and then just turned up the tunes and enjoyed the beauty out our windows, as we drove slowly along. If you do the drive, take your time and stop when you want, no ones in a hurry in there! I hope to go back and could honestly spend days in there, just trying too the different trails. There are tons! We fit a lot in on Day 2. 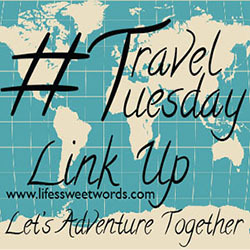 We chose to get the time share spiel out of the way early, so that we would have the rest of the time to enjoy our trip. It honestly wasn't too bad! It was two hours start-to-finish, just like the promised, and they didn't try to keep us there after we said no. The worst part of the whole this was the shuttle ride back to the hotel (the presentation was at one of the other hotels in the time share program). We were done a little after noon and had the rest of the day to explore. Being there in January, the weather was mild down in the valley, but there was still a ski resort open. We knew we were wanting to ski one day and were leaving one day open to most likely do another hike based upon locals recommendations. Unfortunately, I got sick the first day we were there. I had been fighting something already and I don't know if it was the change in weather or what, but I woke up on day 2 just feeling really run down. So, in order to have some energy to ski on day 3, we ended up deciding to forego another hike. Trying to figure out something more low key, we did a quick search for distilleries or wineries that might be nearby. a stroke of good luck! We found out that there were a few wineries within close proximity to each other, just about an hours drive away. Again, even the drive was part of the whole experience. We were on mostly back roads all the way out to a place known as Pahrump. The first stop on our winery tour brought us to Sander's Family Winery. We loved this sweet little vineyard. Owned by a couple who have been in the wine business for many years, they originally ran the first vineyard in the valley. They moved a little further down the road and opened their new facility, that has a beautiful outdoor space for events. The wife was in the tasting room when we walked in and the husband arrived halfway through our tasting. They were so knowledgeable, but more than that, just so kind and inviting. They told us about a few little tourist spots around the area that we needed to drive by and then gave us directions to the second vineyard. Sander's Family Winery is also the only winery we have ever bought a port from (their Ruby Port). Not typically being port fans, their presentation is what really sold us! Instead of just having us just try the port, they actually used it to make a super yummy sparkling sangria, by mixing it with ginger ale and lime. It was so yummy and refreshing! We have been savoring our bottle and have actually made it last since we opened it in February; there may only be enough left for about a sangria each, but it's still lasted us about 6 months. We finished sipping our sangria while strolling the little shop/ tasting room, that is filled with some super neat memorabilia from the the Jazz era on the Vegas strip, and used their directions to lead us to the next winery maybe 5-10 minutes down the road. Pahrump Valley Winery was a little more large scale and commercialized than the first, but still very welcoming. Even better, we discovered they had a restaurant on site. While we had been planning to head back towards the city for dinner, we figured why not just stay. We arrived a little after 3, right after the restaurant had closed from lunch, and found it would not open again until 5. Our tasting only took about 30 minutes, but we passed the time checking out their gift shop and strolling the grounds. They allow for you to buy a bottle of wine and open it there at the tasting bar, so we bought a bottle and filled our glasses to enjoy on our stroll. 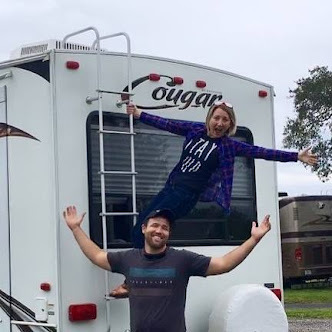 The grounds are stunning and the icing on the cake for us RV lovers?! It backs up to an amazing RV park. We went up the hill to check out the RV park. They were actually setting up for taco night and we found out that they have a lot of awesome events for those staying. If you are ever RVing near Vegas you have got to check out Wine Ridge RV Resort and Cottages. I mean just imagine this being the view from your RV window, which a winery just steps away?! Right at 5 we headed back in for dinner at Symphony's and Oh. M. Goodness!! I am so glad we stayed!! We were able to bring the rest of our bottle to the table with us and then ordered to our hearts content. We got a yummy cheese platter, then I got the lobster bisque and he got a fish platter. Their menu changes regularly to include the freshest ingredients, so it is subject to change, but I can't imagine there being a bad option, because it was all prepared to perfection! We lucked out by getting there when we did, but they recommend reservations. I would recommend making a reservation for the closed off patio, so that you can eat with gorgeous views of the mountains in the setting sun! Though we didn't plan to spend much time in the casinos we did decide to save one night for checking out the old Strip, at the Fremont Street experience, since we didn't do that last time we had been. So, on the way back into the city we first swung by The Gold and Silver Pawn Shop (from Pawn Stars Show), because it was on Babe's "must-see" list. It was neat to peek around and see the shop. Apparently, we had missed Rick by just a few hours, so if you want to make sure you see some of the guys it might be best to go a little earlier on. Right across the street is a bar he owns where he can often be found slinging drinks. We didn't go in (he wasn't there that night), but it's a cool thing to know for the future. Walking onto Fremont Street was definitely exactly as it's described, an experience. There was so much to see and take in I felt like my senses were on warp speed. We went into the Golden Nugget, since I felt that seemed like the most nostalgic "old-Vegas" casino, where I tried my hand at double-deck blackjack. I played for a while and walked away $80 richer, so I wasn't too sad about that. I think my favorite part of Fremont Street though was watching all the artists work. The spray paint artists were so neat; they painted so fast and made such awesome pieces that it was like a show! Mount Charleston is so high that it still gets snow in January, so even though it was warm and sunny in the valley, we were able to enjoy a ski day! Just about 30 minutes from the Strip, Lee Canyon is a great option for a morning on the slopes. We got there right as they were opening (around 9am) and had the mountain almost to ourselves until around lunch time. I hung in as long as I could, but still not feeling super great, I headed into the lodge to sip some hot cocoa and read while Babe enjoyed the rest of the afternoon skiing all the tree trails! They have some awesome, open slopes (which I enjoy), but also some more rugged, glade trails (which Babe prefers). He spent his time dodging tree stumps and then I joined him for two final runs before we turned in our skis to head back to the city. We hit up Nacho Daddy when we got back to the Strip, which wasn't far from our hotel. It was alright, but I wouldn't say any better than any other Tex-Mex style joint. We decided to take the red eye out so that we would have another full day of adventuring. I'm so glad, because our final day was actually my favorite day of the trip! We started it off with a drive out to the Hoover Dam. Babe is a history buff and I love exploring nooks and crannies; the Hoover Dam is a perfect mix of both! We opted for the Powerplant Tour, which is $15 per person and includes your admission to the visitors center. If you are planning to go inside the visitors center at all I would definitely recommend doing at least one of the tours, since cost of admission (which includes a museum and interior overlook) is already $10 per person. So you may as well pay the extra $5 to get the tour which takes you into the powerplant, with a guide, who will tell you the inner-workings of the dam. There is also a $30 Hoover Dam tour, which takes you a little deeper in. We found the Powerplant Tour to be a perfect middle ground (we were trying to save time) and honestly didn't feel like we really needed to see anymore than we saw. $$ Saving Tip: You can also just choose to see the Dam from outside the visitors center and not have to pay a dime! While we thought the tour was totally worth the $$, if you are strapped for time or don't want to pay, you can just enjoy the sights from either side of the dam! **Note on parking: There is a parking garage that cost $10 if you are coming from the Nevada side; if you simply cross the dam to the Arizona side there are non-paying lots that you can park in. You just have a little further of a walk to get to the visitors center. I wish we had known that prior; I despise paying to park! Tip: Be sure to check out the Memorial Bridge! 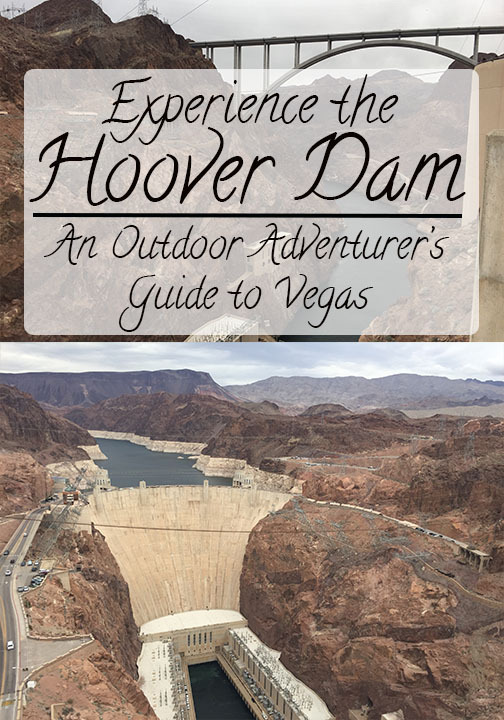 It provides awesome views of the dam and the Colorado River. It is free to experience and there is a great walking history wall that teaches you all about the construction of the bridge itself. Just a word of caution; it is SUPER windy up there, so be sure to hold littles by the hand! Even I felt like I might blow away! After leaving the Dam (we ate lunch at the cafe there, which wasn't too bad actually), we headed towards our final hike! The Gold Strike Trail was actually recommended to us by the guy who worked at the BBQ joint. He said it would be less crowded than other trails, with a lot of spots for bouldering. It was also a hot spring hike! Seriously, for this Florida girl, this was the trail that finally made me realize why people say, "there's no hiking in Florida"! While I do still consider any trial to be hiking, this was a whole new level for me! Having to scale rocks, with the help of a little rope, filled my adventure-loving-heart with happiness. This hike takes you down into a canyon, heading toward the Colorado River. There are little springs throughout the trail and the closer you get to the river the warmer the water gets! I was itching to get in one, but we were running low on time, so we kept forging onward. We didn't see but a few souls pretty much our entire hike down; on the way back up was another story! The guy had warned us that, given the access to the springs, this was a clothing optional hike. As it was getting near dark, we figured once we hit the river, that our walk back would be pretty deserted. Wrong! The locals must come later, to enjoy the spring as the sun goes down. There was a hot spring full of unclothed people, just enjoying the great outdoors. So just keep that in mind if you plan to hike with any sensitive-eyed friends! Those enjoying the spring were very "friendly" and invited us to join, but we said we had to plane to catch and kept on walking. I was still SO WANTING to try out a hot spring though, as I had never been in one. Once we got a little further up the trail, there was one last pretty warm pool, half hidden behind a cove of rock (the largest and warmest one was close to river and very much exposed, plus was full of n'ked strangers), so I figured, "it's now or never"! Sometimes you just have to act like a local, don your birthday suit, and jump in. Babe was reluctant at first and planned to only stand guard. I finally convinced him to let his guard down too (mostly once he realized no one was coming by anytime soon) and we soaked in the natural hot tub for maybe 5 minutes! If you want to enjoy them for longer, plan to start earlier than 3. Babe was on edge the whole time about getting back before dark (which we didn't), so we got out, re-laced our hiking boots, and headed back up the canyon. **Note: If you set out after 3 be sure to bring a flashlight. We spent the last 30 minutes hiking in the dark and, while it was nice to see the stars and the trail is pretty easy to follow, I didn't like feeling disoriented. We still had a few hours to spare before we needed to be at the airport, so we used Yelp to look for somewhere to eat. We landed on a place in Boulder City and really enjoyed ourselves. Boulder City was established during the building of the Hoover Dam, as a place for the men who were working to live. The Boulder Dam Brewing Co. had great nibbles and local brew, but also had really interesting facts on the history of the city. I would definitely recommend Boulder City as a good place to wind down after you visit the dam. It was a great ending to our trip! From there we took our very tired bodies to the airport and tried to sleep. Red-eyes are awesome for the extra exploring abilities, but make for very worn out returns! Any other outdoor places we need to experience if we make it back?! I'm already adding to my list and the O'Briens Abroad have my itching to see Seven Magic Mountains! Looks like some amazing scenery! I bet a lot of people overlook the beauty of Vegas. It really is one of the most beautiful places I have seen this year! Love the red rock canyon!! SO pretty! I've been to Vegas (the glitz and glam part) but as for the "other side of Vegas" I've only seen the Hoover Dam. Would love to go back and see the canyon though--so pretty! It was gorgeous for sure! You could spend days in there and still not feel like you really saw it all. 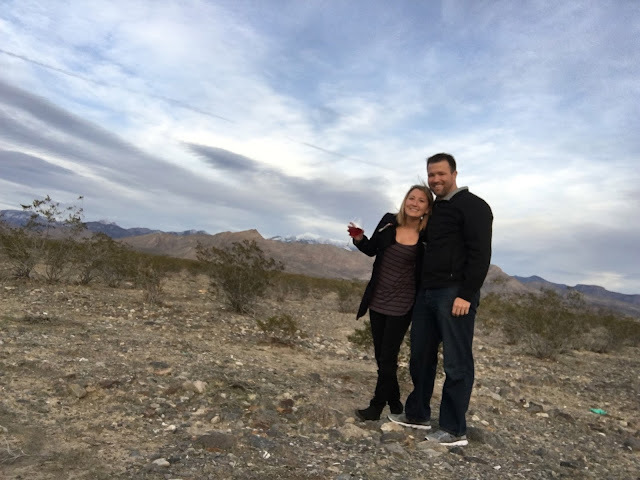 I had no idea that there were wineries nearby Vegas! I'll definitely have to remember that for my next visit! And I loved getting out to Red Rock Canyon when we were there a couple of years ago. It was so beautiful! They were the furthest to get to, but still reachable in just under an hour! Definitely worth a visit :) Especially if you add in dinner! Right?! So hard! It's seeing places like that that make me want to travel more and more; pictures can just never do justice to the magnitude of how big and inspiring it was! Fantastic scenery! I never thought these views would be so close to Vegas! Right?! Me neither! Some of the prettiest places though for sure! 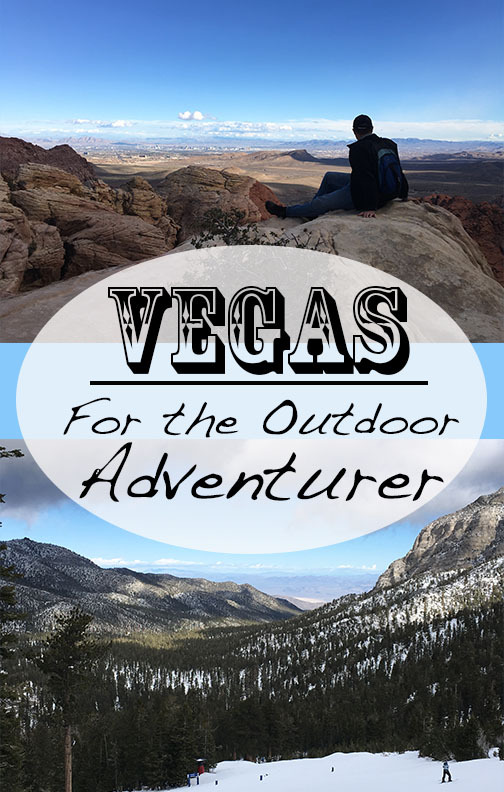 I haven't ventured far off the strip or old Las Vegas, but I've always wanted to check out the nature-y stuff near Las Vegas. The next time I'm there I'll make a point to visit some of these spots! Definitely do!! There are so many beautiful places to explore. Even if you just carved out one day for outdoor fun, it would be totally worth it! I went to the Hoover Dam while going to Vegas by car (from MX no less) and wowwwwwwwww, I know this sounds silly. But how big is it in person?! Like you feel sooo small besides that monument!! Not silly AT ALL!! I had the exact same feeling. Pictures can just never do it full justice; the feeling of actually being there next to its massive size and strength of the wind at the top. So wild! love the mountains! Looks like a well planned trip! I did that scenic loop outside of Vegas so amazing! The desert was flowering that year too. I will have to check out all the other recommendations next time. Awesome! It's definitely beautiful and the more flowering the better! I went to this place with local friends and we had a blast here. The long happy hour at event space Chicago definitely ensures a full upstairs, but I'd recommend the quieter downstairs to enjoy your stuffed burger and fries!